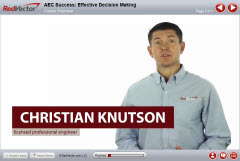 RedVector is happy to announce three new, mobile-ready video courses featuring Christian Knutson! Christian has 21 years of experience in leadership, management, engineering and international relations earned from a career in the U.S. Air Force serving locations across the globe. Over his two-decade long career, he’s developed the soft skills required to effectively lead teams and organizations of 3 to 600 people while delivering value to clients with high-stakes missions. He is also the author of The Engineer Leader, a recognized blog on leadership and life success for engineers and project professionals. Knutson is a retired field grade officer with command experience in the United States Air Force and currently resides in Europe with his family. This RedVector AEC Success series features three courses with very distinct objectives. Effective Decision Making provides you with tools and techniques that you can understand and easily apply to any decision you have to make – at work or at home. Time Management and Billable Hours covers multi-tasking, delegating, and back-to-back scheduling. You will get tactics and tools to make the most of your time and what’s most important to you. Business Development and Sales will give you the basics of business development so you can understand the process, technical skills such as communications and networking and how to take a business strategy and creating an effective plan of action. RedVector is excited about the launch of this mobile-ready series and has several other new courses coming soon. Be sure to follow our blog and check us out on Facebook and Twitter to stay up-to-speed on all the latest eLearning news and course launches!